your divorce settlement is financially feasible. Money Issues Drive Divorce : Get It Right! “Why didn’t I meet you before my divorce! ?” is the number one reaction I get when I tell people what I do and how I do it – by a landslide. My mission is to educate you about important financial issues which may dramatically change the outcome of your settlement and financial future. According to a recent study*, MONEY ranks as the number one worry during divorce – not children or other legal issues. 63% of those surveyed either do not feel financially secure or do not understand their financial situation well enough to know if they should be worried after divorce. 64% said a financial advisor would have been helpful during their divorce (while another 16% didn’t know). Divorce Planning of Austin offers financial options, innovative ideas and creative strategies to construct the best possible financial proposal in marital negotiations and divorce. We address the financial aspects of divorce in a civilized and efficient manner by providing expert Divorce Financial Planning, Consulting and Analysis. While it is important for the lawyer to focus on the legal aspects of your case, it is critical that you have a divorce financial analyst to educate you about financial matters so you know the money you have and the settlement you need. The time you spend with your attorney will be more productive and less costly because you will be armed with the financial knowledge you need to move your case forward. Compensation plans, investments, retirement savings and pension plans are more complex than ever. Engaging an experienced financial advisor may result in greater confidence in negotiations, long term cost savings, and less time and money spent moving accounts or modifying agreements. I provide men, women and couples with financial alternatives that fit specific goals so that the settlement is customized for long term financial success. And I’ll still be there after the judge enters the final decree to see your plan through and to give you confidence about investing for your future. I help individuals who are overwhelmed and confused during this period of transition so they can move forward with clarity and confidence knowing that they got the best outcome possible for their finances, their family, and their future. 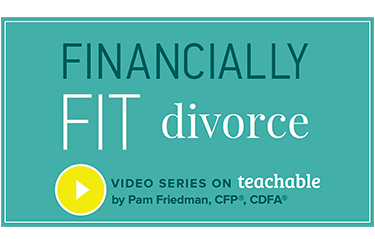 You’ll want to choose a person that has been specially trained to analyze the financial impact of divorce – someone that can provide the quantitative rationale needed to add weight and credibility to your position in negotiations. 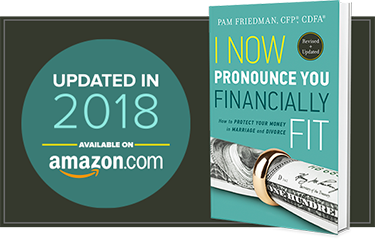 As a Certified Divorce Financial Analyst (CDFA®), I work with you (or you and your attorney) to assemble the financial data to support your interests in negotiations. I help to identify financial options to help improve your position and highlight the consequences and risks of proposed settlements. Get started with a Certified Divorce Financial Analyst® who can guide you through the process and work with you as you enter the next phase of your life.